I haven’t written here in a while. My father was hospitalized for a week, then released in poor condition, and died peacefully at my sister’s home in New York. I’ve been busy preparing for the funeral and for my siblings, who came and stayed for the first few of the seven-day mourning period. In Jewish tradition, the community prepares food for the mourners. I still have leftovers so I haven’t been cooking much at all. Now it’s time to get ready for Passover: here is a guest post I wrote on cooking for the holiday, Pesach Denial. In the meantime I wanted to share a few more memories of my father. I never saw my father cook. He was legally blind, but the main reason is that he expected to be served. Even though my mother was the main cook and I’ve devoted this site to her, I’d like to share a few memories of my father’s relationship with food. My father was a sparse eater, preferring to eat only two meals a day. Breakfast was coffee, a bagel or hot cereal, or maybe an egg. 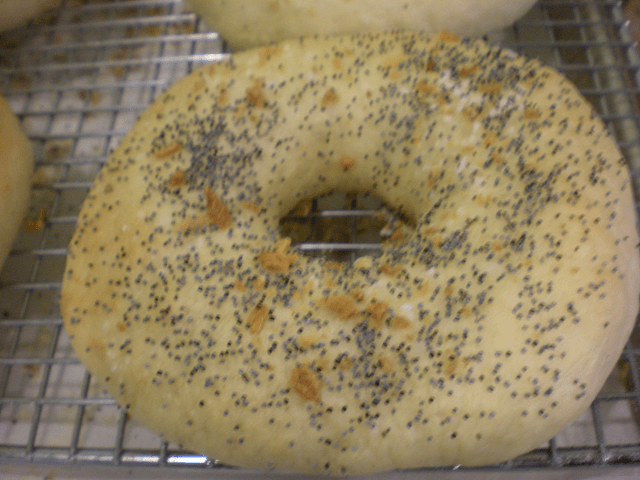 At one point we had an excellent bagel store nearby. He ate numerous apples throughout the day and once joked about an ABC diet, of apples, bagels and coffee. He also drank many cups of tea. His food had to be boiling hot or ice cold, and would send back the soup if it hadn’t come right off the stove. My mother once pointed out that serving foods very hot or cold was a health and food storage issue, as bacteria grown in moderate temperatures. My father grew up in a small town in Poland, where they survived by eating mostly potatoes and whatever vegetables they could grow. His mother supported the family by selling the eggs and milk she collected, with my father’s help, from the local farmers. My parents kept tea essence in a teapot, and my father put a small amount of fresh water to heat in the kettle. Less water meant less time and energy needed to heat it up. He often heated it up before using the bathroom and the whistle would sound before he finished. If someone turned it off he would have to reheat it, but he preferred not to wait. Better yet, someone else would make it for him. On Saturdays, we ate the main meal at lunch. In the evenings my mother would serve a small meal of sardines, or sometimes potato latkes (pancakes). Farmer’s cheese was another favorite. He loaded everything with salt, even before tasting. Later in life he developed high blood pressure and other heart problems, so he had to go on a strict low-sodium diet. As I’ve written previously, my mother served food in individual portions. My father often complained that my mother was giving him too much food and was trying to make him fat. Then he would eat it—my mother was good at estimating quantities. I suppose he was vain about his slim figure but I never recognized this before. So many questions. Well, I’ve been spending twenty years processing my mother’s life and death so hopefully I will have twenty years for my father’s as well. It turns out that I once shared a recipe of my father’s on Cooking Manager. I’m so sorry to hear about your father’s petirah. These are beautiful memories. Thank you for sharing. I enjoy reading about your father, z”l. You were obviously close to him. People may know him in one way or another, but how many knew about his eating habits? His childhood must have been so different than those of my kids, who only know abundance. Leora, many may know as his students worked with him at home, but only I would write about them LOL. Thank you for sharing personal details about your father’s youth. His was definitely a different era. Thank you for sharing. That was so interesting. Glad you enjoyed it, Tzipora. I’m so sorry to hear about your loss. Thank you for sharing these lovely memories, and the nice post about sour milk. Thanks, Rivki. I’m getting redundant but I do appreciate all the comments. Thanks for sharing. I guess if I had made it to the shiva I would have learned more. I always meant to ask you, was your father always blind, or did that happen after you were born? The salt thing made me chickle. My F-i-L adds salt before tasting even if I warn him that it is too salty. My son also goes through several apples a day. I hope your father didn’t leave the cores or half-eaten apples laying around the house. Yosefa, my father hardly left any part of the apple. He would eat melon peel unless my mother removed it for him. He always had poor vision due to macular degeneration, but stopped driving over 30 years ago. Welcome back and thanks for writing this interesting post. I have missed you. Do you ever make tea essence the way your parents did, and how long did it keep? I hope you’ll have some time to relax even though Pessah is coming soon. Happy Pessah! Your father could have been my father. Amazing how these personalities translate across Europe, the Atlantic and time.